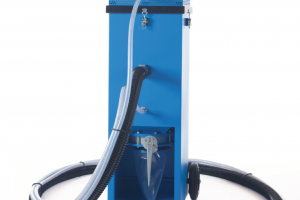 The Airblast vacuum blast machines provide an environmentally friendly dust free blasting solution which is easy to use, versatile and powerful. The use of steel abrasive provides cost effective, efficient and powerful blasting as well as close control of the surface preparation. Easily inter-changeable blast head fittings allow a variety of surfaces to be blasted including: flat, inside and outside corners, small & large diameter pipes etc. Additional accessories are available for specific applications such as to blast large horizontal surfaces or the edges of steel plates. As the process is safe and dust free other production processes can be carried out close to the blasting operation.